With special guest Dale Reno, guitar. 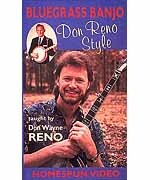 The banjo style created by the legendary Don Reno melds traditional bluegrass breakdowns with chord-based solos, percussive techniques and flamboyant single-string runs. Don Wayne Reno passes on his dad's groundbreaking techniques and great advice as he analyzes eight classic Reno tunes: Dixie Breakdown - Banjo Signal - Follow The Leader - Little Rock Getaway - 5 By 8 - Cumberland Gap - and the kick-offs to 'I Know You're Married (But I Love You Still)' and 'I'm The Talk Of The Town.' The most complete Reno-style banjo lesson you'll find anywhere! 60-MINUTE DVD - INCLUDES TAB - LEVEL 3.